To Food with Love: Churros from Heaven! When G saw the title of this post, he laughed and started to imagine thousands of churros falling from the sky. Well, I wish [it was cloudy with a chance of churros]! But really, these little spanish doughnuts taste so heavenly I could probably eat a whole plate of them. They are basically deep-fried choux pastry, light and crisp on the outside, soft, creamy, buttery and fluffy on the inside. And I didn't even need to dunk them in hot chocolate (which I didn't prepare as I discovered that I ran out of dark chocolate). They were just lovely to eat on their own, with a generous dusting of cinnamon sugar. 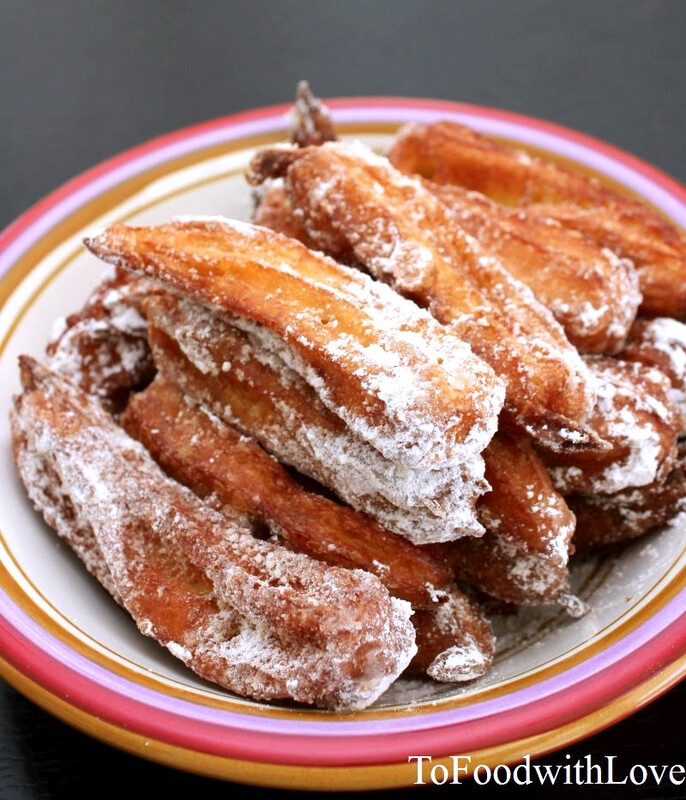 Hot churros dusted with cinnamon sugar. Yum!!! For churros, combine milk, butter, sugar and water in saucepan and bring to boil. Add flour, stir quickly with wooden spoon to combine. Cook for 3 mins over medium heat, stirring constantly. Spoon the mixture into a food processor. Add the vanilla extract and eggs and process until mixture is smooth. Heat oil in large deep frying pan. To cook churros, oil a spatula, then use a large piping bag with a 1 1/2 cm star nozzle to pipe figure of eight about 6 cm long onto the blade. Slide churros into the hot oil and cook for 4-5 mins, turning often until golden and cooked. Alternatively, just pipe the dough directly into the hot oil and cut off the end with a knife (or your finger will do the job too). Drain on paper towels. Dust churros with the cinnamon sugar mixture. For the chocolate diping sauce, place the cream in a pot/saucepan and stir over medium heat until it comes to a simmer. Place chocolate pieces in a heatproof bowl, pour over the warm cream, then stir until the chocolate has melted. Serve warm with hot churros. If you don't have a food processor: Remove the saucepan from the heat and let it cool slightly for about 5-10 minutes. Add vanilla extract, and beat in the eggs one at a time with a wooden spoon till well combined. If you don't have a piping bag, simply scoop out the dough with a tablespoon and drop them into the hot oil to make doughnut balls!